In the State of Rajasthan, India there are any places to visit. Jaipur is one of them. Jaipur is the largest and Capital City of Rajasthan. Hindi, English, Brajbhasha languages are used in this place. Jaipur is famous for Forts, Palaces and Monuments. Ridhi Sidhi Pol is famous place in Jaipur. This place is popular for History Buffs, Experience Seekers and Fun Lovers. Visitors can spend 1 hour easily in this place. Ridhi Sidhi Pol is located near the heart of the city. There are many attrations near this place. Ridhi Sidhi Pol is an important doorway in the magnificent City Palace of Jaipur. In the State of Rajasthan, India there are any places to visit. Jaipur is one of them. Jaipur is the largest and Capital City of Rajasthan. Hindi, English, Brajbhasha languages are used in this place. Jaipur is famous for Forts, Palaces and Monuments. 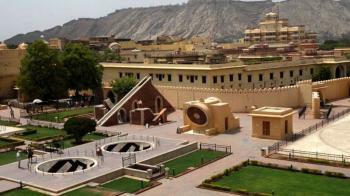 Jantar Mantar is also tourist place for visit in Jaipur. This place is located near Hawa Mahal and City Palace. The Jantar Mantar in Jaipur is considered to be the largest of the five observatories. The Jantar Mantar houses various architectural and astrological instruments that have caught the interests of astronomers, historians and architects around the world. It is considered to be one of the largest observatories ever built. The ideal duration of this place is 3 to 4 hours. This place is popular for Experience Seekers, Photo Fanatics, Wanderers. The name derived from the Sanskrit words "Jantar" which means "Instrument" and "Mantar" which means "Calculate". The term "Jantar Mantar" literally means "instruments for measuring the harmony of the heavens or calculating instruments". In State of Rajasthan, India in the district of Udaipur there is beautiful place for visit called Udaipur. Udaipur is located at the base of the Aravali mountain range. Udaipur is also called by Udaypur. This place is famous for Historical and Scenic. There are many places to visit in Udaipur. There are many attractions in this place. Lake Pichola is one of them. Pichola lake is an oldest lake in Udaipur. Pichola Lake was an artificial lake which was made in the 14th century to cater to the shortage of water in the region. The ideal duration of this place is 1 hour. This place is popular for Experience Seekers, Photo Fanatics, Nature Lovers. This lake is a freshwater lake. The surface area of this lake is 696 hactares. The maximum length of this lake is 4 km and the maximum height of the lake is 3 km. In the State of Rajasthan, India there are many places to visit. The most famous place in Rajasthan is Jaipur. There are many attractions or temples in Jaipur. Birla Mandir is one of them. This temple is located in Jaipur. It is a Hindu Temple. The ideal duration of this place is 1 hour. This place is good for God Lovers, Experience Seekers, Nirvana Seekers. There are many devotees come in every year. It is very famous temple in Jaipur. There are many festivals are celebrated in this temple. The most famous festival is ‘Janmashtami’. This festival is celebrated on a grand scale. On the outside walls of the temple, great historical figures from all religions are shown. These figures are Socrates, Zarathustra, Christ, Buddha, and Confucius. In the state of Rajasthan, India there are many places to visit. There are many beautiful places and National park to visit. Desert National Park is one of them. This park is located in the near the town of Jaisalmer. The distance of Jaisalmer is 40 km from Desert National Park. This park covers an area of 3162 sq. km. Around 20 per cent of the park area is covered with sand dunes consisting of craggy rocks, compact salt lake bottoms, inter-medial areas and fixed dunes. This park was established in the year of 1992. There are different kinds of flora and fauna found in this park. There are many attractions in this park. Major attractions are Great Indian Busturd and The Thar Desert Ecosystem. There are many activities in this park i.e. Jeep safari, Camping, Bonfire and bird watching etc. Rajasthani, Hindi, English languages are used in this place. This park is best for Nature Lovers and Experience Seekers. The ideal duration of this park is 4-5 hours. 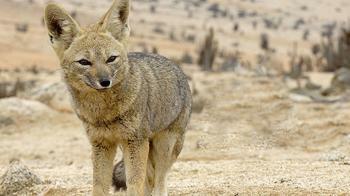 For visiting the park, you need to take a prior permission from the Desert National park office and office of the District Magistrate, Jaisalmer. Bharatpur is known as "Lohagarh" and the "Eastern Gateway to Rajasthan" and is famous for Keoladeo National Park. Bharatpur is the city located in the Braj region and newly created municipal corporation in the Indian state of Rajasthan. It is also the administrative headquarters of Bharatpur District and the headquarters of Bharatpur Division of Rajasthan. The Royal House of Bharatpur traces its history to the 11th century. Bharatpur is part of National Capital Region (NCR). Bharatpur lies on the Golden Tourism Triangle of Delhi–Jaipur–Agra and hence a large number of national and international tourists visit Bharatpur every year. In the State of Rajasthan, India there are any places to visit. Jaipur is one of them. Jaipur is the largest and Capital City of Rajasthan. Hindi, English, Brajbhasha languages are used in this place. Jaipur is famous for Forts, Palaces and Monuments. The altitude of this place is 431 mt. 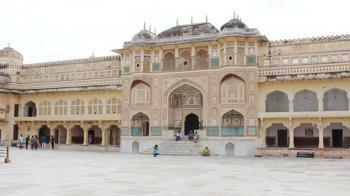 There are many places to visit in Jaipur. 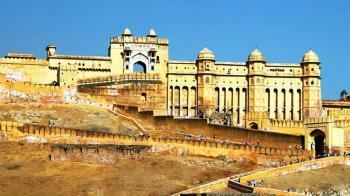 Jaipur is the most imporrtant and famous tourist destination. It was established by the Maharaja Jai singh II in the year of 1727. 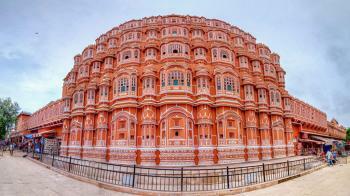 Jaipur is also known as Pink City. It is called so because a large number of the tourist places in Jaipur are of the terracotta pink color. Places are Forts, Havelis and Palaces. In the State of Rajasthan, India there is a beautiful city to visit called Jaisalmer. 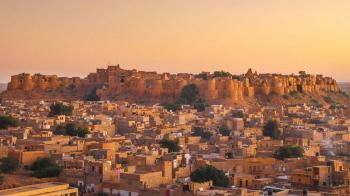 Jaisalmer is also known as "The Golden Fort". It is also a nickname of Jaisalmer. Jaisalmer is also known as "The Sun City". It is a world heritage site. The town stands on a ridge of yellowish sandstone. It is the largest district of Rajasthan. There are number of Forts in this place. This place is interesting place to visit in the Rajasthan. This place is famous for its Historical Monuments, beautiful forts, lakes, and gardens. Keoladeo National Park is situated in Bharatpur district in Rajasthan and is also known as Bharatpur Bird Sanctuary. It is a famous avifauna Sanctuary that consist of thousands of birds specially in winter season. 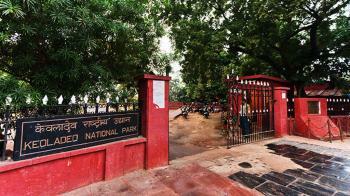 The park was declared as protected sanctuary in the year 1971. The aprk is man-made and man-managed land and is one of the national park in India. The park is home to 366 bird species, 379 floral species, 50 species of fish, 13 species of snakes, 5 species of lizards, 7 amphibian species, 7 turtle species, and a variety of other invertebrates. The park is the one of the richest birds areas in world. In State of Rajasthan, India in the district of Udaipur there is beautiful place for visit called Udaipur. Udaipur is located at the base of the Aravali mountain range. Udaipur is also called by Udaypur. This place is famous for Historical and Scenic. The altitude of this place is 600 mt above the Sea level. Hindi, Rajasthani and English languages are used in this place. Udaipur was found by Maharana Udai Singh II in 1553. The city was established as the new capital of the Mewar. This new capital of Mewar had a much less vulnerable location than Chittorgarh. 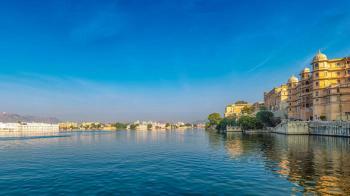 In the Udaipur there are many beautiful lakes so Udaipur is also called City of Lakes. 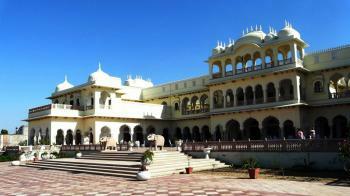 There are many places to visit in the Udaipur. There are many attractions of the Udaipur so that many tourist come in Udaipur every year. . The main attraction of the Udaipur is City Palace of Udaipur. There are many temples, Havelis in this place. This city is beautiful tourist spot. Near the town of Sawai Modhpur, Rajasthan there is a national park known as Ranthambore National park. It is one of the largest National park. This park is best place to see the animals. Ranthambore national park was declared a wildlife sanctuary in 1957 and in 1974 it gained the protection of "Project Tiger". It got it's status of a National Park in 1981. Ranthambore National Park is covers the area of 392 km sq. along with its nearby sanctuaries like - the Mansingh Sanctuary and the Kaila Devi Sanctuary. This national park is 130 km from Jaipur. This national park is one of the best locations to see the majestic predators in its natural habitat. This park is famous for its Tigers. Tigers can be easily spotted even in the daytime. The best times for tiger sightings at Ranthambore National Park are in November and May. 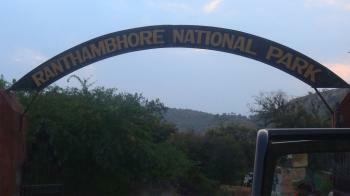 Some of the important places at and around Ranthambore National Park. 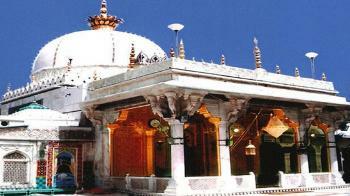 The Dargah Sharif is situated in the Ajmer, Rajsthan. This is a Dargah of Moinuddin Chishti. This Dargah is also known as Ajmer Sharif Dargah or Ajmer Sharif. An Islamic mortmain managed by the "Dargah Khwaja Saheb Act, 1955" of the government of India. This is the most famous pilgrimage in the Rajasthan. Dargah Sharif is the resting place of Khwaja Moin-Ud-Din Chisti. This is a holy place where you can meditate and can pray the lord. Dargah Sharif is situated at the foot of the Taragarh hill. From the central Ajmer Railway station, the distance of Dargah Sharif is 2 km. Ajmer Sharif Dargah is considered as the holiest Muslim shrines. The shrine is visited by millions of pilgrims every year. Around two courtyards it consists of several white marble buildings including the large gate donated by the Nizam of Hyderabad and the Akbari Mosque. Mughal emperor Shah Jahan built this gate. It contains the domed tomb of the saint. Every year Akabar and his Queen came here from Agra in observance of a vow. Nizam Gate is the main gate followed by the Shahjahani gate. 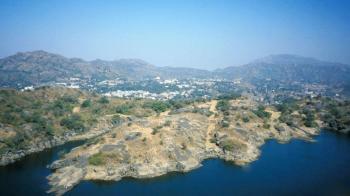 In the Sirohi district of Rajasthan there is a popular hill station in the Aravalli range called Mount Abu. It is also known as Abu Parvat. 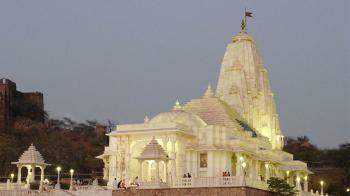 It is situated in the Western India near with the border of Gujrat. The mountain forms a distinct rocky plateau 22 km long by 9 km wide. Guru Shikhar is at 5650 ft above the sea level. It is the highest peak on the mountain. It is referred to as 'an oasis in the desert' as its heights are home to rivers, lakes, waterfalls and evergreen forests. In this mountain there are many hindu temples. Pushkar is situated in the state of Rajasthan in India. 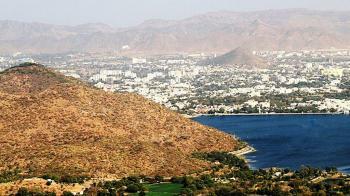 The lake of Pushkar is situated in a valley about 10 kms to the northwest of Ajmer. It is surrounded by hills on three sides and desert on the other side. It is one of the most holy place for Hindus. Pushkar is really a quite peaceful and beautiful place. The lake is surrounded by 52 bathing ghats and more than 500 Hindu temples are situated around the lake. It is a supreme place of pilgrimage for Hindus. Most of the Hindus visit here for visit to Brahma Temple, they take a dip in the holy water of Pushkar Lake before going to the temple. 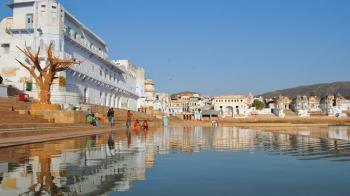 The water of Pushkar Lake is clean and the lake is surrounded by many temples and ghats. There is a ghat on lake famous as "Sunset Point" where Indian and foreign tourists assembled in the evening to see the beautiful Sun set . You may find many local indians and foreign tourist playing their musical instruments on this ghat in the evenings. 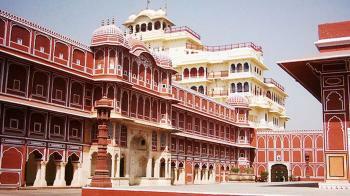 It is one of the prominent tourist attractions in Jaipur city. Known as the palace of winds it has some 950 windows called jharokhas, decorated with intricate latticework through which the women of the court could watch everydaylife outside without being seen. It is located in Jaipur’s old town and like all the buildings in this area it's painted in pink. Hawa Mahal, which forms part of the east wall of the City Palace, was built for the women of the royal family. It was a place where they could sit behind the laced windows looking down on the daily street life and parades below without being seen. Hawa Mahal was made in such a way that the breeze circulates through these windows, giving the palace its name.